Design by Sandro Santantonio, 2007. 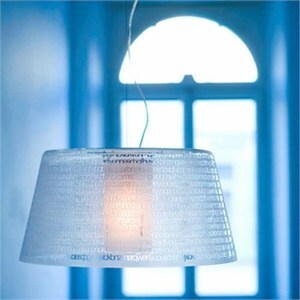 Suspension lamp for diffused lighting. Chrome or matt white painted metal structure. Choose from standard center mount or the optional off-set swag option. Diffuser in clear crystal, black crystal or opal white all with sandblasted engravings. Internal screen in Pyrex glass. Dimensions 21.25"D X 10.6"H; 78.75" overall height, can be field shortened. Uses 1 X 150W 120V E26 (medium base) A21 incandescent lamp (not included) or 1 X 250W 120V E26 (medium base) T10 double envelop halogen lamp (not included).